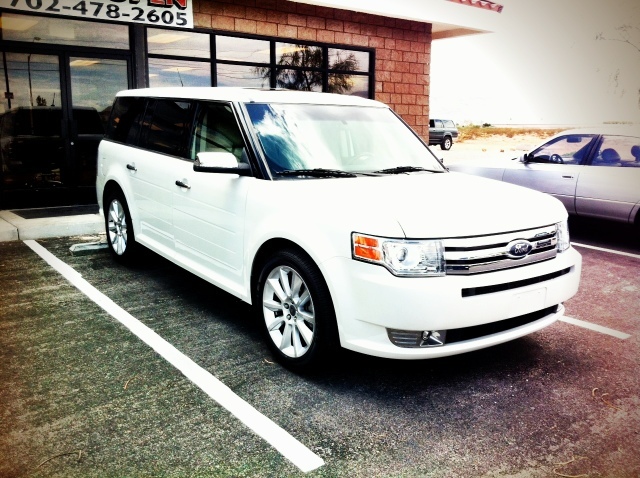 Speedy Car Loans Las Vegas: Check out the Ford flex speedy car loans sold this week! Do you know about this SUV? Check out the Ford flex speedy car loans sold this week! Do you know about this SUV? Ford started making the flex in 2009. The seven passenger SUV has second and third row seats that fold flat onto the floor. The vehicle also includes a mini refrigerator in the middle console. A voice activated communications and entertainment system, called Ford sync integrates with the functions of cell phones, Sirius satellite radio, compact disc, DVD and other media players as well as the navigation system. This technology was developed in collaboration with Microsoft. The Ford flex also includes adjustable mood lighting, a multi panel Vista roof, and a built in hard drive for music and picture storage. Another impressive option the Flex offers is Ford's Active Park Assist system, which finds and measures a parking space, then operates the steering wheel to automatically parallel park. This feature uses software control of the Electric Power Steering (EPS) system in response to inputs provided by ultrasonic sensors. A competing camera-based system from Lexus takes three times as long. If you're in the market to buy an SUV, the Ford flex is one you should definitely check out… You will be impressed!